Excited to tour, but which of my bikes should i take? Hi everyone, i am excited about doing my first tour but am confused about which bike to take. None of them are tourers and they all have advantages and disadvantages to them. i live in florida and want to ride north probably avoiding mountains. i am a male, 5'6", 190 lbs., 8.5 shoe. i already have a rear rack, panniers, and a brooks b17, and would probably switch the bars for trekker or moustashe bars. thanks for all you help. disadvantages: 32 spoke wheels, one set of eyelets for rack/fenders, aluminum frame, 16 1/4 chainstays. disadvantages: ones set of eyelets for racks/fenders, low end components that needs some work, 16 3/4" chainstays, 26" wheels. or Performance bicycle has a good deal on the Fuji palisade 1.0. it has two sets of braze ons for bottle mounts, two sets of eyelets for fenders/rack, MTB triple crankset, 36 spoke 700c wheels, front rack included , canti brakes, hi-ten fork, aluminum frame. has what looks like low end components. I can afford this bike and like the way it feels under me but am afraid of its lower quality. performance link below. If were me I'd take the Trek 500 and switch out the crankset for a tour friendly set. There're lots of ways to attach racks, fenders and bottle mounts without braze ons. you leave out how much weight you intend on carrying. Nothing wrong with one set of eyelets. i plan on taking whatever i will need to be self sufficient for a few months. camping and cooking gear, few sets of clothes etc, so i guess fully loaded. One set of eyelets on the dropouts are enough. You can attach both rack and fenders to the same one. I tend to think John Bailey's recommendation is a good one. All three bikes would make perfectly competent tourers. Which is the most comfortable to ride for eight hours? Pick three Saturdays and find out. That bike is the one you want to pick. All the other variables are easy to work out. Yes fit is the most important. It easier to say change to triple than to do it. Make sure you have the chain stay length to avoid heel strike on any pannier you put behind the foot. It might be easier to pick the right pannier than to change that crank. Me I'd go for bike two if it fits, and I could solve the problem of heel strike. thanks for help everyone i think im gonna go with bike #1 i like this one and i've ridden it a bunch. i will probably swap the crankest, brakes, and derailleurs from the 1100 its alot of work but i think i will be happier on the 500.
bike #1 was a $30 craigslist find, as were the trek 1100 and the jamis. Last edited by delux68; 08-09-10 at 07:48 PM. 26" wheels are inherently stronger, so the ones on a good mountain bike should be fine. Get some good slick tires. Heel strike can be a problem, especially if you have big feet (14 here) so get your panniers and try them on the different bikes. There may be no problem. Low gearing is a big deal on tour if you're going over any passes, or if there will lots of hills. A mountain crankset is not overkill, in my opinion, and on a road crankset I like at least a 24-tooth granny. You have options. Try them out on some mini-tours before heading out on a big tour. How much do you weigh? I should note that I weigh 200 and am tall, so everything I bring is large. I also tend to bring a lot of stuff. If you're light and you're load is light you'll have far less to worry about than I do. I'm pretty excited, I finally got myself a proper touring bike. It's a Huffy Sa... just kidding. 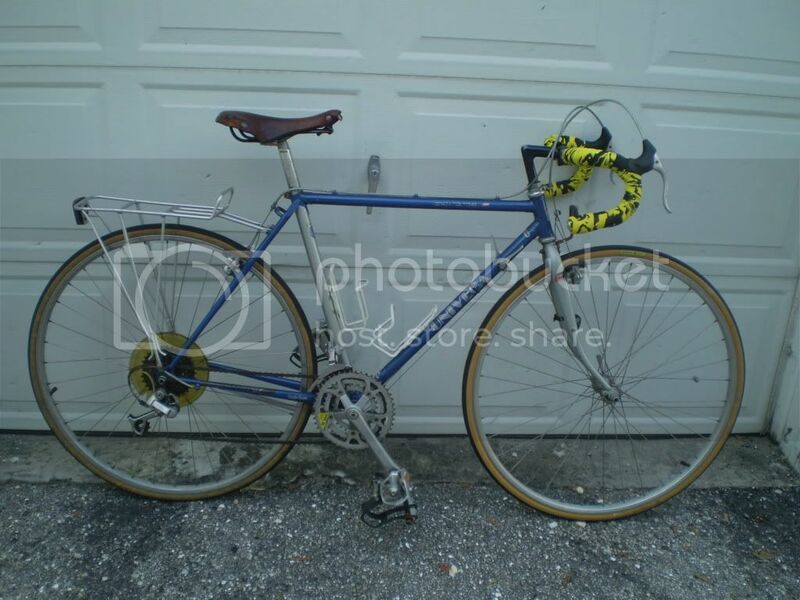 Its a Univega Gran Touring, 1989 I think from the others I've see here on bike forums. It looks to be all original and in good shape except for some scratches here and there. It came with a rear rack and two bottle cages. It needs some cleaning up and a new rear derailleur cable but overall I'm pleased. I paid $65.00. I think the major score is that it has a Brooks Swift titanium saddle that is "on sale" right now at nashbar for $379.99. whoo-hooo!!. It is dry and warped but I hope I can bring it back. Thanks for all your help everyone. Last edited by delux68; 08-23-10 at 07:32 AM. That doesn't narrow it down much because one person might say that and carry 25 pounds and another might carry 100 pounds and describe what they carry the same way. I'd advise shooting for 30-35 pounds and if you are much above 40 pounds I would say to definitely take a long hard look at the packing list. BTW, in my experience your packing decisions will have more to do with your success than what bike you choose. With a light-ish load, low enough gearing, and a bike that fits you well you will probably be fine. Blogging on tour / Witur?